After picking up three of four possible points away from home last weekend, it’s back to the road for the Ottawa 67’s, starting Thursday in Sudbury. Winners of 14 of their 16 with points in all of them, the Barber Poles are firmly entrenched in top spot in the OHL’s overall standings. The second-place team, the Sault Ste. Marie Greyhounds, host Ottawa on Friday night to try to close an eight-point gap. With a record of 17-3-2-0, the Barber Poles have been a dominant force in the OHL this season while getting contributions from throughout the lineup. Ottawa has a league-leading 85 goals for which have come off the sticks of 15. Felhaber is also the OHL’s second-leading top scorer with 37 points. Rookie Marco Rossi has also been on fire as of late. The rookie has picked up nines points over the 67’s past five games. Not only is Rossi the OHL’s leading rookie scorer, but he is also the top first-year player in the CHL with 27 points in 22 games. The 17-year-old Austrian center has 13 more points than teammate Jack Quinn, who is the second-best rookie in terms of putting up points this season in the OHL. The QMJHL’s and the WHL’s top scoring rookies have both put up 21 points so far this season in their respective leagues. The Wolves are currently doing well as a team, winning 3 of their last 4 meetings, most recently pulling off a shootout win in Sarnia on Saturday. Currently second in the Central Division and third in the Eastern Conference, Sudbury has been surprising a lot of people this year, especially considering the fact that they finished dead last in the OHL last season. Led by 2015 first overall pick David Levin and the 2018 first overall pick Quinton Byfield, this offense lacks no dynamic talent. The one player who has separated himself from the bunch and that has been a key part in this successful start to the season for the Wolves is 6-foot-5 Finnish goaltender Ukko-Pekka Luukkonen. The Buffalo Sabres’ 2017 second round pick has a record of 9-3-1-1 this year, with a goals against average of 2.48 and a very impressive save percentage of .926%, adding a shutout as well to his tally. The Wolves’ netminder has stopped 30 or more shots in 7 of his 14 career OHL starts. Last time these two teams played, Luukkonen was the biggest reason why the game was sent to overtime, as he made 45 saves against the Barber Poles in the loss, where Kody Clark scored the overtime winner. Only one team has amassed more points than the Greyhounds’ 28 in the OHL’s overall standings so far this season, and that is the Ottawa 67’s. As of late, the Greyhounds have not been playing their best hockey of the season, as they are currently riding a three-game losing streak. Some would argue that Soo has lost to some weaker team during that stretch, including Erie and Flint. Before this losing skid, the Greyhounds were right up there with Ottawa in the mix for first place, but with this recent short slump, the 67’s have now taken a commanding lead in first place of the OHL standings. After going for it all last season, a big question mark was on the Greyhounds, whether they would be able to compete as one of the league’s top teams once again or if they would struggle a bit more. Those questions have been answered on the ice, as Soo is obviously on the same path as last year and share the exact same goal, which is to win a championship. Morgan Frost has been the obvious best player for the Greyhounds so far this year, picking up 36 points in 21 games. Another player to watch will be the Arizona Coyotes’ 5th overall pick in the most recent NHL Entry Draft Barrett Hayton, who has put up 21 points in 14 games since coming back to junior hockey. Ottawa has played against the Soo once this season, defeating them by a score of 6-2 back in early October in a game where Tye Felhaber and Austen Keating picked up 3 points each. After winning their last two games, the Battalions will look to extend this to a three-game winning streak on Thursday, when they will be playing against the Barrie Colts. 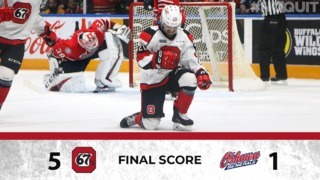 North Bay will then be hosting the Sudbury Wolves on Friday, before they host the Ottawa 67’s for the second time this season on Sunday the 18th, which will be the 67’s final game of their road trip. Last time these two teams met, the Battalion were on the winning side of things, defeating the Barber Poles 4-3. That game, defenseman David Maier scored twice for North Bay and Justin Brazeau had three assists. Brazeau, the OHL’s top scorer, is in a heated battle with the 67’s Tye Felhaber for the OHL’s top scorer. This season, Brazeau has 19 goals and 20 assists for an impressive 39 points in 19 games. 12th overall in the OHL standings, North Bay will be looking to climb the standings a bit, and what better way to do it then by beating the league’s top team for the second time in as many meetings. Taking the road this week, the 67’s have had their fair share of success on the road this season, with a record of 8-2-2-0 as a visiting team this season. The top five in OHL +/- is made up of five 67’s players. Austen Keating leads the league with a +25, followed by Marco Rossi (+23), Tye Felhaber (+21), Merrick Rippon (+20) and Lucas Peric (+17). Goalie Cedrick Andree leads the league in wins with 15, while Austen Keating leads the OHL in assists (25). With a total of 85 goals scored and only 61 allowed this year, Ottawa has the best goal differential in all of the OHL with a +24.